An ornate mantelpiece, decorated with sculpted reliefs of lion heads and scrolls occupies the center of the design. A carved frame, supported by pilasters and ornamented with garlands, rosettes, and griffins terminates in a triangular pediment. The overmantel contains an antique bust of Antinous. 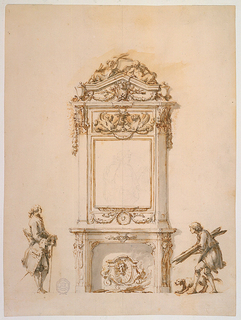 Flanking the mantelpiece are two men - on the right a man of humble origins accompanied by a dog crouches, holding wooden planks. On the left, a well dressed man stands and watches, holding a walking stick.